Sukkot, also known as Feast of Booths or Tabernacles is a popular Jewish holiday which is one of the three biblically based pilgrimage holidays. It is the time to thank and appreciate the shelters of our homes and bodies as Sukkot is a hut-like structure in which Jews lives when they were travelling during 40 years. Sukkot 2018 will start from the evening of Sunday, 23rd September and will end on the evening of Sunday, 30th September. Sending warm wishes and greeting messages to family, friends, near and dear ones on Sukkot festival is a way of expressing your best wishes. 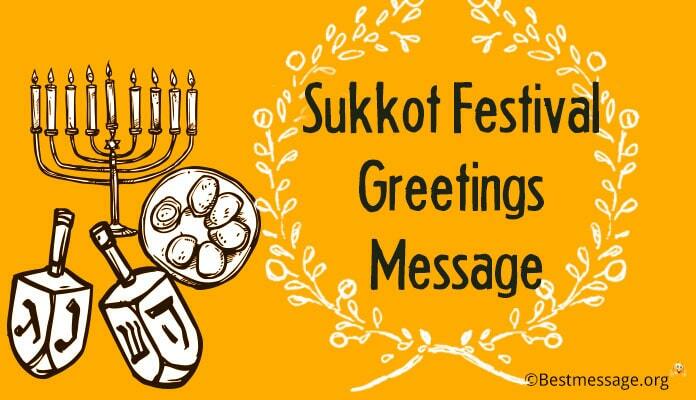 We bring a wonderful collection of Sukkot Festival 2018 wishes and messages to spread peace, joy and happiness amongst those who are dear to you via Facebook and WhatsApp. Check This : Lots of free Hanukkah greetings messages you can write in your card. 1. I wish that the bounties of Sukkot Festival shower on you and your family eternal happiness and keep you bonded together with love and affection forever….. Happy Sukkot to you!!! 2. On the pious occasion of Sukkot festival, let us thank the Almighty for protecting us, loving us and giving us a home full of happiness and body blessed with health…. Wishing you a joyous Sukkot. 3. As we get ready to celebrate Sukkot, I am sending you best wishes on this auspicious occasion…. May you are blessed with happiness, good health, peace and prosperity in life…. Sukkot Shalom!!! 4. I wish that you enjoy the best of Jewish food on this Jewish holiday…. May the Feast of Booths is full of delicacies and merriment for you and your loved ones…. Happy Sukkot!!! 5. Sukkot Shamlom!!!! I am sending my best wishes on the occasion of Sukkot Holiday to you and your loved ones…. May you have a memorable and joyous Sukkot. 6. May there is happiness and prosperity, health and wealth in your life…. May the Feast of Tabernacles is full of enjoyment and moments of happiness with your friends and family…. Happy Sukkot!! 7. I wish that you have a house full of happiness and harmony and a heart full of love and affection for all…. Sending my best wishes on the pious occasion of Sukkot… Have a memorable Sukkot Festival. 8. May the festive occasion of Sukkot brighten your life with merriment, enjoyment and love of family and friends…. May you are always smiling and prospering in life…. Happy Sukkot!!! 9. As we are all set to celebrate Sukkot festival with our loved ones, I wish that you have the most memorable Sukkot of your life blessed with blessings of Almighty…. Happy Sukkot to you. 10. Sukkot festival is here and it is time to engage in celebrations and feast with the loved ones…. Wishing you a week full of zealous celebrations…. May you have a memorable Sukkot!! !